International Women's Day and Engineering - A Great Mix! This article is one of the articles in our series Women in Software, in which we hear perspectives on a range of issues related to women who study and work with computers and software. “Using technology is cool, but I found out today that making it is simply awesome” - these were the words of a 10 year old girl after she took part in the International Women's Day Robotics workshop, and followed a day of experimentation, learning and fun. The event took place on March 7th at the University of Southampton’s School of Electronics and Computer Science, and was organised by Dr Reena Pau as part of our celebrations for International Women’s Day. The event was attended by 70 girls and young women from five schools, namely Park High (London), Testwood School (Southampton), St-Edmonds (Salisbury), ALNS (Portsmouth) and Sturnminster (Dorset). The day started with welcome talks by Professor Michael Butler, and also Professor Dame Wendy Hall, who shared her experiences as a woman working in the computing field. Michael’s talk echoed Professor Karen Spark Jones’ maxim that “technology is too important to be left to men”. Suitably inspired, the girls were then split into various groups for different activities. These included Optoelectronics, where they were given a chance to learn about concepts of both electronics and light, and Nanotechnology, which gave them insight into its ongoing impact on the world. I helped run the robotics workshop as one of the Robogals, a student-run organisation that helps to increase female participation in Engineering, Science and Technology. 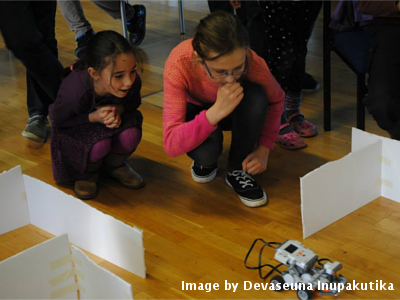 In the workshop, students learned the basics of engineering, robotics and programming using Lego Mindstorms EV3 kits. The students’ enthusiasm was infectious and inspired us Robogals to put on a busy, eventful day. As one of the students said, “the Robogals’ training was nothing like I expected. I gained confidence in myself, became motivated to fulfil my potential as a female engineer and became inspired by the amazing guest speakers. The day was action packed, informative and resulted in a close group of friends. I have come to the realisation that women in engineering are powerful and are eager to encourage you." The event was a great success. It showed that developing a culture in which women can excel and inspire takes a concerted effort led by several groups. There is still a lot of work to be done, but the positive response across campus makes me believe we are heading in the right direction. Best of all, and as a result of the incredible response we got on the day, we have now also been given the chance to organise workshops during the upcoming Science and Engineering family day. We are also in some promising talks with some wonderfully interesting schools for more projects next term. It was a very successful day, and by the looks of things, not the last!